The piano is a very versatile instrument – it allows you to play almost an entire orchestra with just two hands. If you’re familiar with Skoove’s courses, you’ll notice that in the Beginner Courses we emphasize playing the melody with the right hand while accompanying the bass notes on the left hand. This is because we want you to develop the pianistic skills according to your level and make sure you’re making progress easily towards becoming a complete pianist. 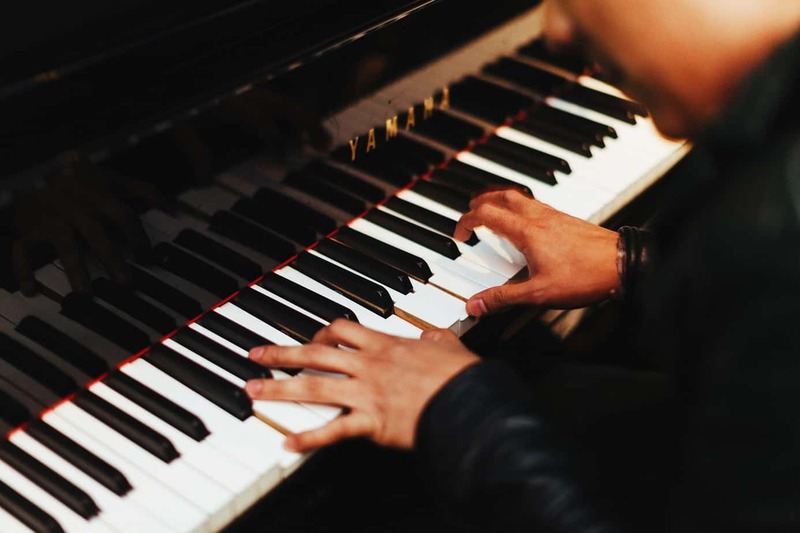 However- if you’ve seen artists like Adele or John Legend perform on Youtube, you’ll notice that they often accompany themselves on the piano with beautiful chords instead of playing the melody. It’s not unlikely, that this could also be your aspiration: Singing while accompanying yourself on the piano. Typically three or more notes played together, forming the basis for harmony. How do I know which chords to play when? More and more collections of songs on the “Beginner Songs Course” will have the letters written above the score. You see the “C” and “Dm”? Those are the accompanying chords to be played optionally. Just an alphabet like “C”, “F” or “G” etc. stands for major chords. Where as a letter plus “m” like “Am”, “Dm”, or “Bm” etc. stands for minor chords. 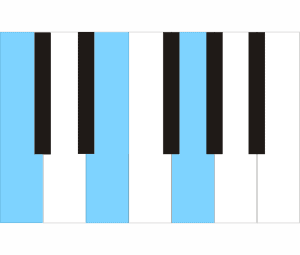 These types of chords are called Triads, meaning they consist of three notes. If the chord has four notes, then they are called Seventh-chords, and are often represented with “7” like “G7” or “Dm7” etc. You should note, “Dm7” is still a D minor chord, and simplifying it by playing the triad instead of tetrachord is totally fine and sounds good. Is there a shortcut to know what notes to play? Yes! 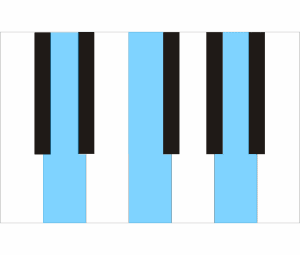 The structure of a chord type is always the same. First, you need to find the root note, which is the letter itself. Then memorize these steps to find the two other keys to play. When I say steps, I mean half-tone steps, meaning you count all the keys including the black keys. Major chord: Root, 4 steps above, and another 3 steps above. Minor chord: Root, 3 steps above, and another 4 steps above. Here is an example in C-major. Play these keys on the keyboard and enjoy the happy sound of major. Here is an example in D-minor. Play these keys on the keyboard and enjoy the sad and sentimental sound of minor. How do I get started with chords? – Start with simple songs that have 2-3 or chords. – Play the chords on the “one” and play them only when a new chord comes, so you have time to prepare your fingers. What do I do when there’s a bar with no chord symbol above the score? This generally means play the previous chord, unless the entire bar is a rest. I hope this blog post was helpful. Get started with playing chords and look forward to all the new songs being released on Skoove every month!